If you’re like me you enjoy being outside; grilling with friends on the weekend, sipping a cup of tea after work, or playing board games with the kids. Just being outside makes the activity more fun. But after a certain hour, with no sun beaming down on you it starts to get chilly and the cold drives you indoors. Luckily landscapers and designs put their heads together and devised a means for people to enjoy being outdoors from morning through the evening. They popularized the use of outdoor fireplaces and outdoor fire pits. Now you and your family and friends can continue grilling or playing board games until the wee hours of the night. Any chill that you would have felt is thwarted by the warm crackling flames emanating from your stone fire pit. Fire pits can take many shapes and be constructed from many materials. There are fire pit ideas that have hidden propane tank with the fire pits and numerous fire pit tables. If you prefer a fireplace outside, you can have one custom built or by one pre-fab or you could buy a classic chiminea, an outdoor cast iron stove. 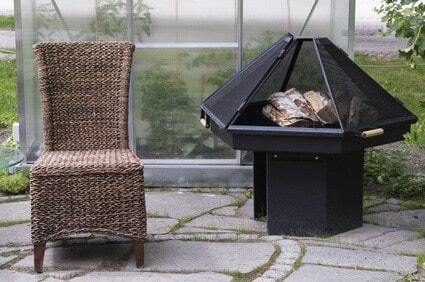 Outdoor fireplace units are made of stone are generally gas burning. Very few are wood burning. The stone comes in a variety of shapes, colors, and sizes. Whatever design you require can probably be bought. If not, a fireplace could be designed to your specifications. Outdoor fireplace units are standalone stone structures that function as fireplaces. Choosing a unit that fits in with your outdoor décor will finish your outdoor design perfectly. Whenever you want outdoor warmth, outdoor heating apparatuses like outdoor gas patio fire pits or patio fireplaces or outdoor fireplace units can be used to ward off the cold. These units have built in fire pit screens and many can be built into the exterior of the house forming a patio fireplace. If you’re looking for a free-standing unit or an addition to your building, the options to have such units are plentiful. Fireplace tables are a wonderful combination of communing together around a fire while grilling or sharing a few drinks. Family and friends can sit around the table using the edges to hold drinks and food while the food is being grilled in the center portion of the fireplace. These tables are usually powered by gel fuel, liquid propane, or natural gas. The tables can be made for wood which is treated to withstand the heat of the fire or decorative steel and stone. The stone ranges from marble to granite. Your fireplace table can provide heat or when warmth is not needed act as storage for a gigantic ice bucket keeping some brews chilly. All year round this table can be central to entertaining, providing warmth with its fireplace element and cooking meals to cooling off the family in super hot summer days and nights. If you’re like me, you don’t like complicating your life. Entertaining at your house needs to be simplified. If you use a fireplace table, it can be simplified even further. No one even has to get up from their seated position. Your guests can eat drink, stay warm, and socialize while they sit enjoy the crackling warm embers of the fire.